UN-led peacekeepers in Darfur are to be allowed full unrestricted movement in a deal agreed with Sudan's government. It means Khartoum will permit night flights and full access across the western Sudanese province for the 9,000 joint UN-African Union troops there. However, key non-African units are still not being allowed and two-thirds of the force have still to deploy. At least 200,000 people have died and 2m been displaced in Darfur since the conflict began some five years ago. The Darfur peacekeeping force is meant to be 26,000-strong later this year - which will make it the UN's largest force - and has faced a number of obstacles imposed by Sudan's government. The Status of Forces Agreement setting out the legal framework for the mission to operate in Sudan was signed in Khartoum by Foreign Minister Deng Alor and peacekeeping head Rodolphe Adada. It allows free movement into and around the province for United Nations African Union Mission in Darfur (Unamid) personnel, as well as easing restrictions in a number of areas including communications. However, the force still lacks the attack helicopters it needs to move around the arid region, which is the size of France. On Friday the UN special envoy to Darfur, Jan Eliasson, warned that the region was edging towards full-scale war after Sudan launched a big operation attacking rebels in two towns in West Darfur. The five years of fighting have involved Sudan's government, pro-government Arab militias and a number of rebel groups. The government denies links to the Janjaweed militia, which is accused of trying to "cleanse" black Africans from large swathes of territory. 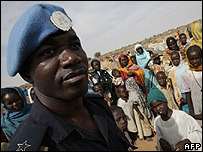 Some two million people have been displaced in Darfur. Many have been accommodated in camps where the security is poor.